0.28 mi🥘The Hummus & Pita Co.
0.3 mi🥘Chloe's Soft Serve Fruit Co. Looking for centrally located office space in Midtown South? If you want to work among some of the greatest minds in technology and media while surrounded by rich history and culture, Union Square may be the place for you and your business. Union Square is at the heart of NYC’s burgeoning tech community, which is now ranked as the second largest startup ecosystem in the world. Tech companies now account for nearly 30 million square feet of NYC’s office space inventory, or around eight percent. On average, Union Square office space for rent costs less than $70 square foot for a direct lease, and upwards of $80 per square foot for office space in a Class A building. These prices are comparable to other prominent Midtown South neighborhoods including Chelsea, Greenwich Village, and SoHo. And with more than 32 million square feet of inventory, there’s office space to accommodate businesses of all industries and sizes. Union Square’s convenient location in the heart of Manhattan, excellent hotels, vibrant outdoor space, and multiple subway options make it a popular place to work or meet clients. The neighborhood boasts a population of more than 25,000, and nearly 350,000 business professionals, students, and artists come and go during an ordinary workday. The area is bordered by the Flatiron District to the north, Chelsea to the west, Greenwich Village to the southwest, East Village to the southeast, and Gramercy Park to the east. Union Square provides a fun environment for foodies and proponents of farm-to-table. The area features a special program to provide fresh food in the city. Since 1976, the Greenmarket program in Union Square has allowed regional farmers to sell fruit, vegetables, and other farm-grown items to city inhabitants. Come to the market Monday, Wednesday, Friday or Saturday between 8 a.m. to 6 p.m. to purchase fresh food and experience Union Square culture. Do you fancy a more traditional city dining experience? Visit one of the many surrounding cafes, restaurants or vendors. Our favorite restaurants in the area include Bowery Road, Ichabod’s, Villanelle, Gotham Bar and Grill, and Taboonette. 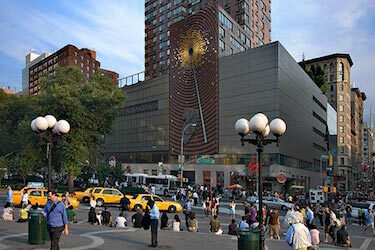 Union Square, which rests at the junction of Broadway and Fourth Avenue, represents the southern border of Silicon Alley, an area earning its name because of its impressive tech business and startup boom in the past few years. In 2015, venture capital firms invested more than $7 billion in Silicon Alley businesses. Dozens of global tech, media, and advertising businesses have offices in the area, including Facebook, Hulu, and Buzzfeed. 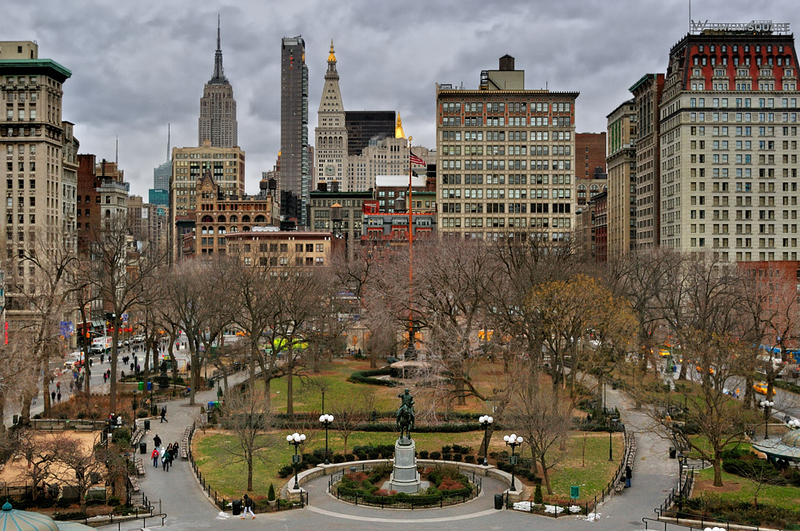 Union Square is also home to more than 6,000 small businesses. 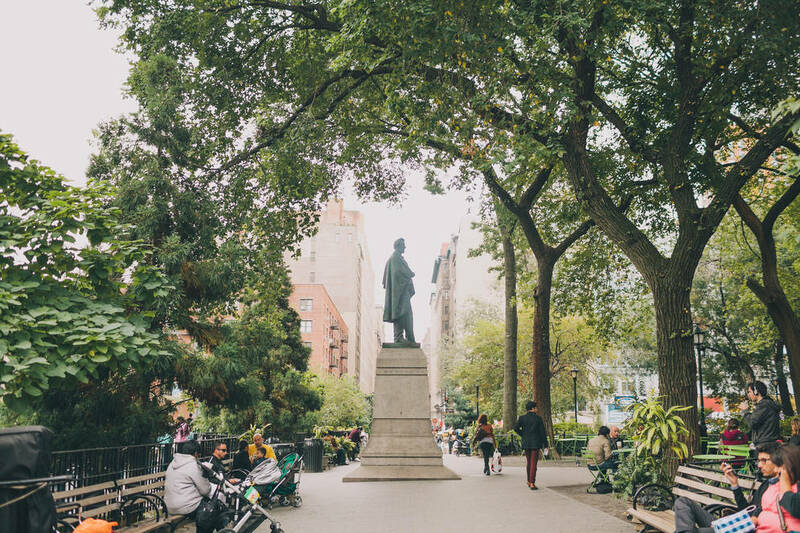 This charming historic area is known for the adjacent park that shares its name: Union Square Park, which built in 1839 and redesigned in 1872. This bustling park and plaza, located between 14th Street and 17th street, provides space for professionals, New York University students, street performers and the occasional protestor to mingle. 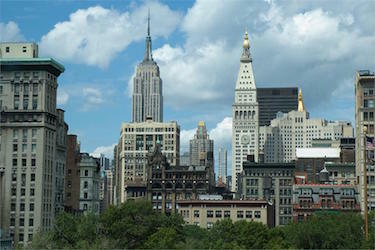 One can also find art, historic landmarks, and the longest-running farmer’s market in New York City. Union Square features several prominent artistic landmarks. One is the Metronome and Countdown Clock, a large digital clock over 14th Street that shows hours, minutes, seconds and tenths of a second. Union Square also includes an equestrian statue of U.S. President George Washington, which was the first public sculpture displayed in New York City since 1770. The bronze-cast equestrian sculpture represents Evacuation Day, when the British departed from the city, and Washington and his troops returned to it. Other statues include Abraham Lincoln and Mohandas Gandhi. The United States’ national holiday of Labor Day originated in Union Square neighborhood. The first Labor Day parade took place on Sept. 5, 1882. Workers marched from City Hall to Union Square. The Central Labor Union of New York then suggested Labor Day be celebrated throughout the country on the first Monday of every September. Union Square also hosted the first Earth Day celebration on April 22, 1970. Interested in finding the right Union Square office space for your business? Feel free to reach out and we’ll connect you with one of our commercial real estate brokers.